It’s a great time to be a hockey fan in Chicago. 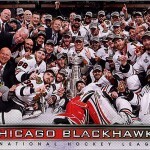 The Blackhawks won the Stanley Cup, which is as good as it gets. 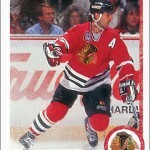 But fans will be rewarded with a special commemorative hockey card set from Upper Deck. The special boxed set will contain 30 card — 25 player cards and five cards of season highlights. It will also include an oversized team photo card (pictured above). The set will be released on July 23 and cost around $20. Personally, I am psyched about this. 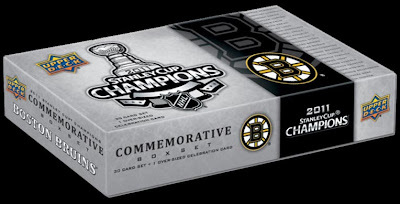 The Boston Bruins received a commemorative set in 2011 after winning the Stanley Cup. 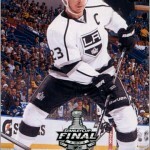 The Los Angeles Kings did not get a full commemorative set in 2012, although a six-card giveaway set was released. This reminds me of the old Pro Set Superbowl sets, where the company would issue cards of both the winning and losing team, as well as a special card album. I hope that Ben Smith — who played in only one game, but it was in the Finals — gets a card, along with other bit players like Jamal Mayers and Daniel Carcillo. That’s very likely, as 25 player cards would pretty much cover everyone who appeared in the 2013 playoffs for the ‘Hawks. Now, if only they’d make cards of the coaches, too. Steel City Collectibles is now accepting pre-orders for this set. This is sweet. 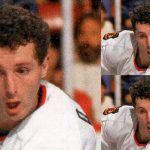 I really wished they did this last time Chicago won, so I’m super-excited they are doing it now. 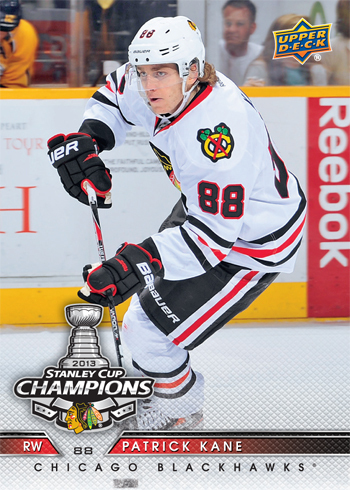 Cards look great design-wise from what we see of the Kaner sample, and I love the oversized team card. Yeah. I wish they made a commemorative set in 2010, too. But Upper Deck did not have to go “above and beyond,” in my opinion, because they had no competition from Panini at the time. So happy UD is coming out with this set since they missed the boat in 2010. If they also announce “A Day With The Cup” inserts in the flagship I’d be excited (and poor chasing them down)! 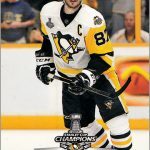 If the Day with the Cup inserts are like 1-in-1000 packs (or whatever they were two years ago), then I’ll have to pass on those. But if they’re pretty easy to come by, I’ll try and complete that insert set.